People who are not Black activists often believe that the Black movement went away after the late 1960s, either because it won or because people just gave up. 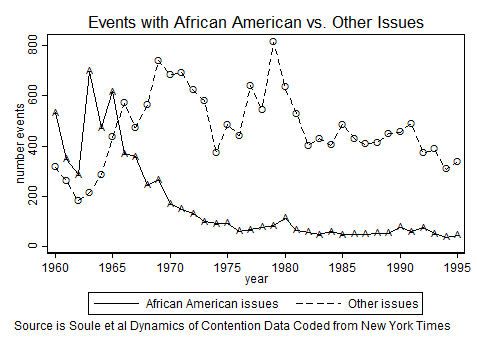 And the available data certainly shows a steep decline in Black protest events as covered by the New York Times. The graph below is calculated from the publicly-available Dynamics of Collective Action Data. But, of course, the Black movement did not go away. People shifted other forms of activism, including Black Studies (Rojas)m Black professional associations (Bell), and local campaigns. And they just got less news coverage for what they did do, as media attention turned elsewhere. It is very important to study movements in what “the doldrums,” when media attention has turned away, to gain insight into the issues and actions that keep the movement going until the next big upsurge. CORRECTION 8/31/17: In reviewing the data collection process before submitting this work to peer review, we discovered an error had been made in the very first step of selecting articles to be fed to the MPEDS program. This error led only articles with the word “boycott” to be selected. This means that the events described in this blog and the associated paper all happened, but there were many ,more events that also happened that were not captured in this research. We are returning to the data collection process and will be issuing an update after this is complete, probably a year from now. I am leaving up this post and the accompanying paper with a corrected abstract to leave a correct record of events. As described in my previous post, we collected data on 167 articles describing 227 events related to the Black movement for 1994-2010, in the “doldrums” of the Black movement between the end of the Civil Rights Movement and the resurgence of Black Lives Matter. This post summarizes the patterns of protest we found. The full paper is posted on SocArXiv. Even though (as we explain in the paper) our data certainly do NOT provide anything remotely approaching full coverage of the Black movement, they are the only systematically collected data we are aware of after the end of the Dynamics of Collective Action data in 1995. The graph shows the distribution over time of events, articles and mentions of events in articles. There is a peak in 2000. 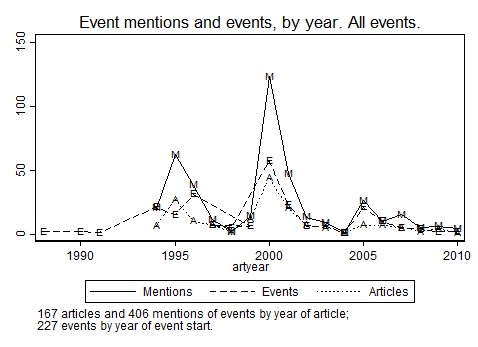 There is a secondary peak in 1995 that is a large number of article mentions of a few events, and a smaller peak in 2005 that tracks a significant number of distinct events covered in a few articles. The decline in coverage after 2011 is doubtless due to the impact of 9/11 and the subsequent War on Terror and then the Iraq War, which both led to heightened repression against social movements and attracted media coverage to other events and issues. Judging by the traces in these news wire stories, the most important issue about the Black movement in this period concerned the interpretation of US history. 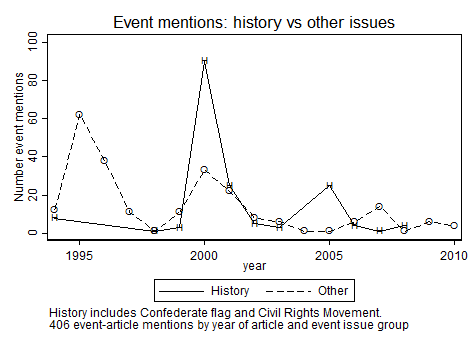 Contentious protests and boycotts about displaying the Confederate flag were 21% of events and 29% of event mentions; 18% of events and 13% of event mentions were commemorations of civil rights heroes. The graph shows that these events about history peaked in 2000. That year there was a great deal of coverage of the flag dispute in South Carolina and other states and also a lot of coverage of events on Martin Luther King Day, which was celebrated in all 50 states for the first time that year. Taken together the news stories imply a discursive struggle over the meaning of US history and of Black people in US history. The 2005 spike is the events late in the year around the death of Rosa Parks and the commemoration a few weeks later of the 50th anniversary of the Montgomery bus boycott. The 1995 peak is driven by 16 articles mentioning two paired events: protests against Freddy’s, a White-owned clothing store in Harlem, and the killing in early December of eight people in the store by a person who had been protesting. The stories always were pegged to the killing but generally discussed the broader issue of the protests and often linked the Freddy’s protest to other similar protests in Harlem. The Million Man March, which occurred in October of that year, the biggest and arguably most significant Black movement event of the decade, received substantially less news wire coverage. Beyond these “big news” stories, the sparse coverage of other Black protest events nevertheless yield clues about what else the Black movement was doing. Of the events that involve current issues, rather than the proper way to remember history, boycotts of firms for alleged discrimination against customers or employees was the most frequent category, accounting for 38 events. There were boycott campaigns against Firestone, Texaco, Kmart in the mid-1990s, campaigns against Coca Cola and Adams Mark hotels in 2000-2001, and against BP in 2006. These campaigns typically involved protest events in multiple cities to support the call for the boycott. Research by King and Soule found that media attention to boycotts could affect shareholder price and affect corporate behavior even without much consumer impact. Besides the huge Million Man March, there were other “Black solidarity” events in the 1990s that made the news, generally because of accusations that event speakers or organizers were anti-White or anti-Jewish or because of clashes with the police. Although we have reason to believe that much Black movement energy went into local and campus issues in the period, and we know that issues of police violence and racial disparities in traffic stops and incarceration were subjects of movement activity, the wire service stories give only a few traces of these. Most stories referencing police violence were tied to the Cincinnati riot in 2001; there were only 4 other instances of protests about police killings mentioned. Most of the local conflicts that got news coverage were in New York and generally treated Black boycotts of White-owned businesses as instances of ethnic conflict in a changing city. Only two local conflicts outside New York got significant play in the news wires: a series of protests and counter-protests and school arson in Wedowee, Alabama in 1994 after a school principal banned interracial dates and the prom; and the “Jena 6” protests in 2007 about the extremity of criminal charges against Black boys who assaulted a White boy who had hung a noose at their high school. There was very brief mention of other local protests in other cities, including protests by Blacks in Los Angeles and Houston that were directed against immigrants. There were also several reports from the 1990s about conflicts at specific college campuses over racial issues. And there were several stories in 1996, 2000 and 2004 with a local tinge that were about Black protests against White nationalist activities, as well as events focused on hate crimes in 1998 and 2007. The stories about these various local and campus events tell a story of ongoing conflict between Blacks and Whites or among minorities. Overall, looking descriptively at the content of events in the news sources as they clustered over time both allows us to see what people who didn’t know any better would think was going on if they only read these national news source and to see glimmers of clues pointing to a much larger vein of organizing activity and inter-group conflict. It is important to gain more data to fill in the empirical gap for this era, as well as more carefully to theorize media-movement relations and the ways movements function in the doldrums, when media attention turns away from.